Scattered around PICTORIAL B1, there are 10 small, red-orange circles with the numbers 1 through 10 next to them. These represent spaces where you might want to put RESIDENCES. Perhaps they could all be Glass Dome Houses. As the design above shows, they could be 35-foot diameter, 962 square feet each, for one level or floor, and double that, 1924 square feet, counting both floors. 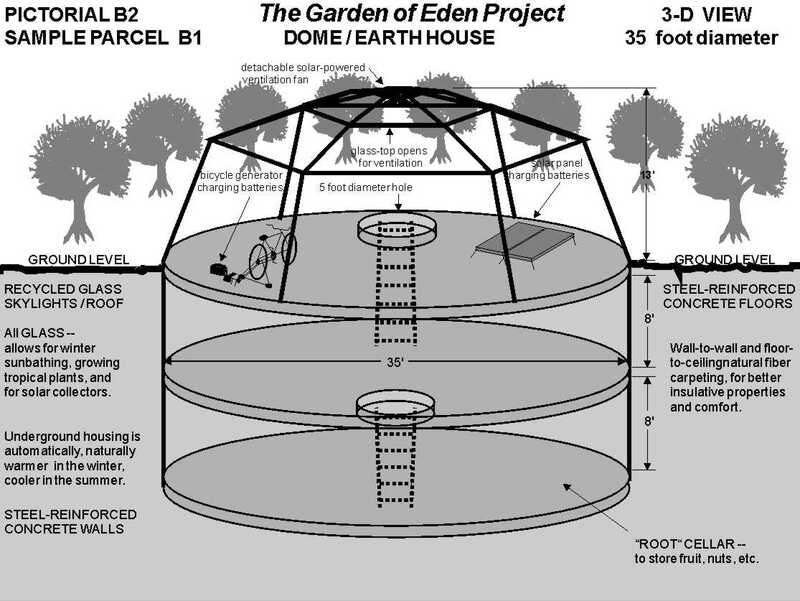 Although Glass Dome houses might be more expensive than the Plastered Straw Bale House, they would still be ecological housing. These structures would work well where you want to make full use of sunlight. The glass top floor of the house could serve several purposes: 1) Indoor gardening; 2) Indoor sunbathing; 3) Indoor stargazing; 4) Indoor solar collectors or photo-voltaic cells; and more.